Last week-end I held a Halloween theme party for my daughter’s birthday. We started the party with 2 Halloween crafts. 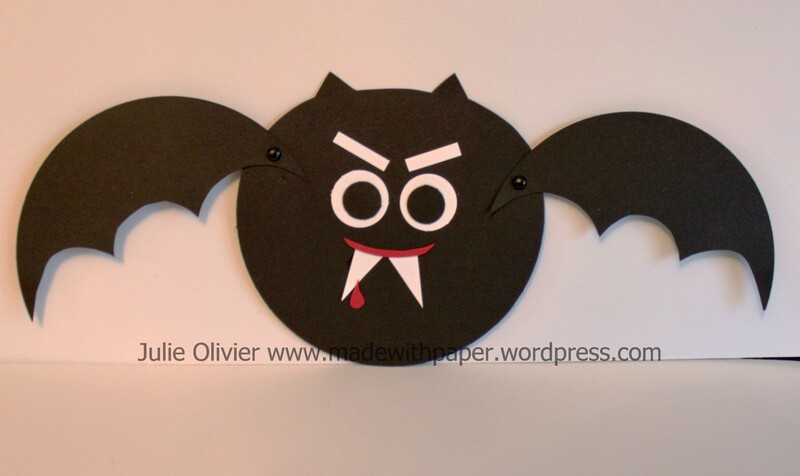 The first one is a Bat with moving wings. 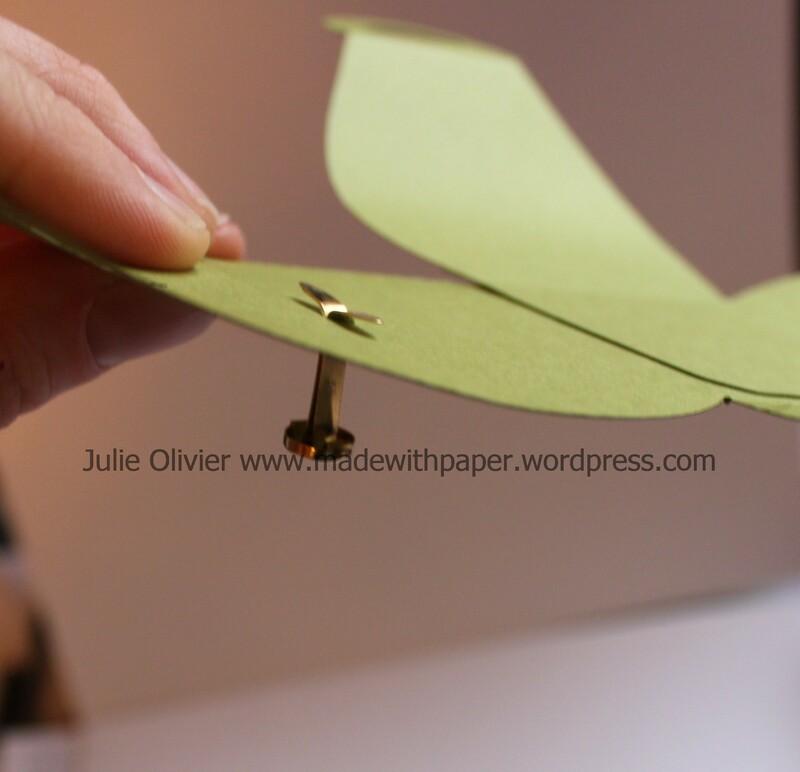 After cutting each part, we assembled the 2 wings with little brads, so you could move the wings up and down! The eyes were made of 3/4″ and 1/2″ Circles. The rest was simply hand cut. 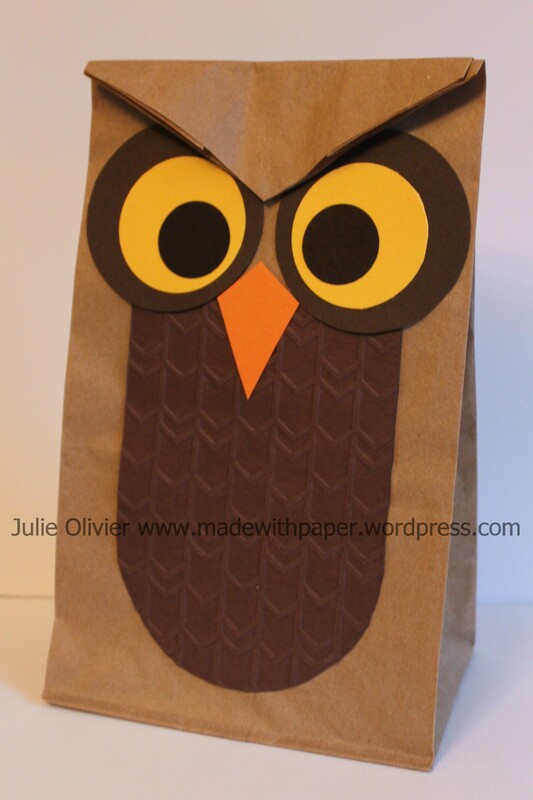 Every child also made their own “Owl Loot bag” with a Brown Lunch bag. 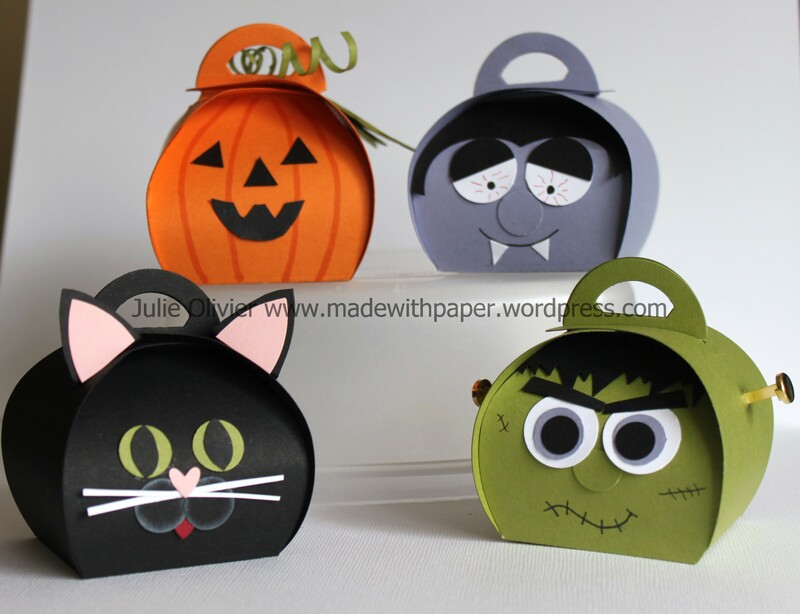 (It was perfect to carry all their little surprises and candies that they had at the party!) Simply cut the top of the bag in a point and fold. The eyes are made with 2-1/2″, 1-3/4″ and 1″ Circle punch. We emboss the body with the “Arrows” embossing folder. Children loved it! Surprise Design with the Curvy Keepsake Box! 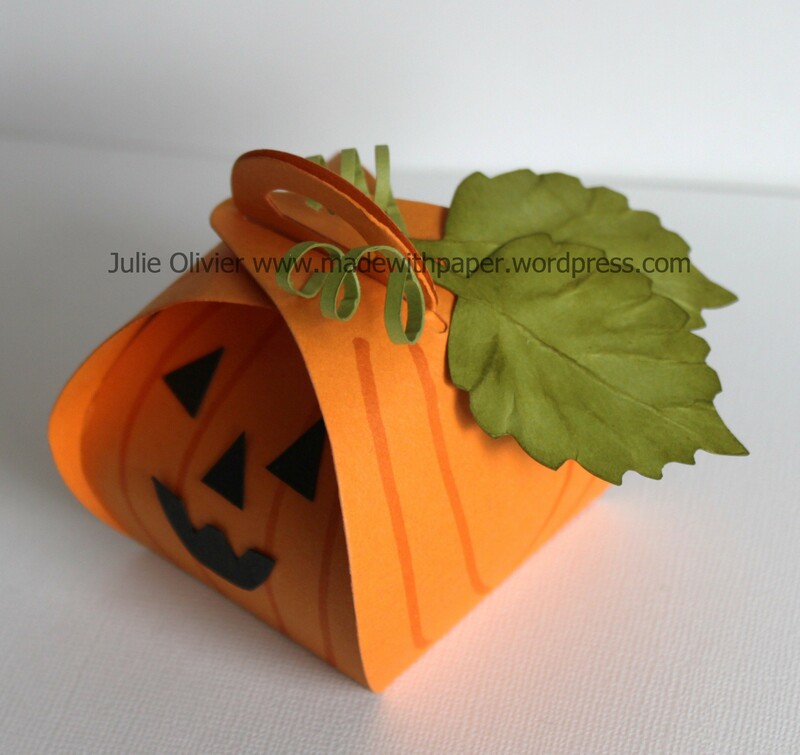 Remember, I told you I would have a surprise design for you at the end of the week with the Curvy Keepsake box thinlits dies? Well, here’s my Scarecrow! I really like that one! Which one is your favorite design? 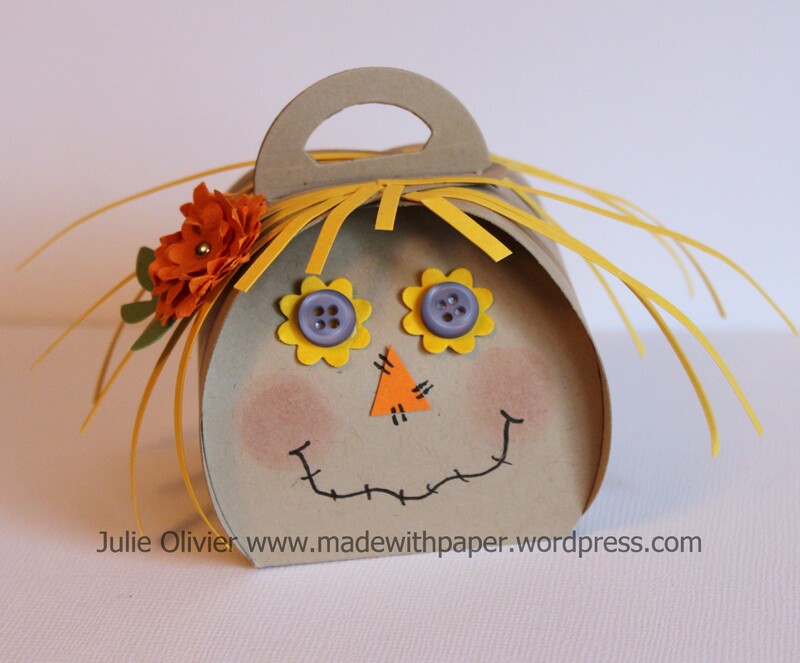 To make this cute scarecrow, I used Crumb Cake card stock for the base. I used the Boho Blossom punch for the eyes, (with 2 subtle designer buttons) and I layer a couples of each flower from that punch to make my flower. I used a tiny Silver brad to hold it in place. 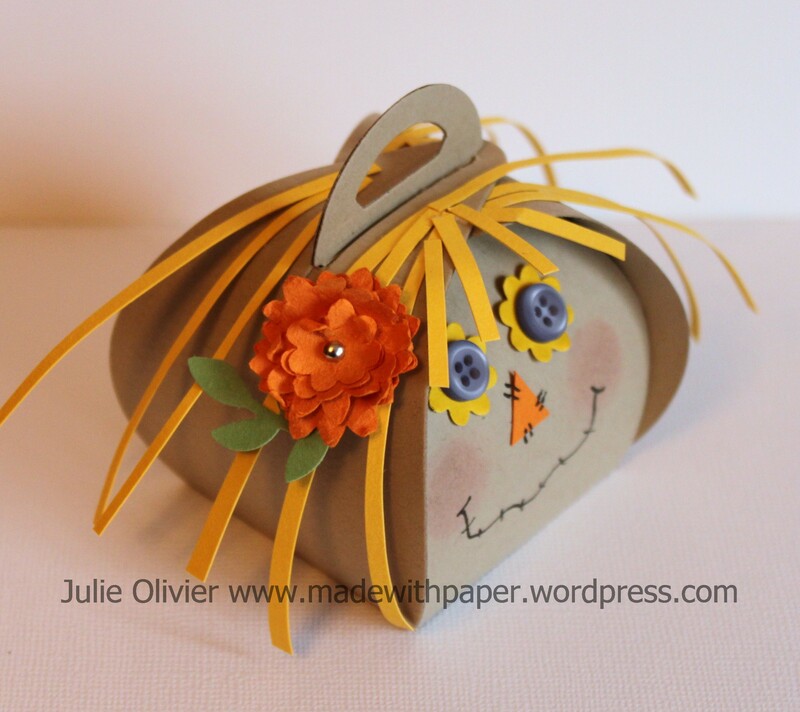 The hair are strips of Daffodil Delight card stock. Here’s a little trick, use the Fringe Scissors! (Much faster to cut! )When you glue them on the box, make sure you don’t adhere the strip on 2 sides at the same time or you won’t be able to open your box without ripping the hair! The face was completed with a Black marker and a little “Pink Pirouette” dauber for the cheeks. 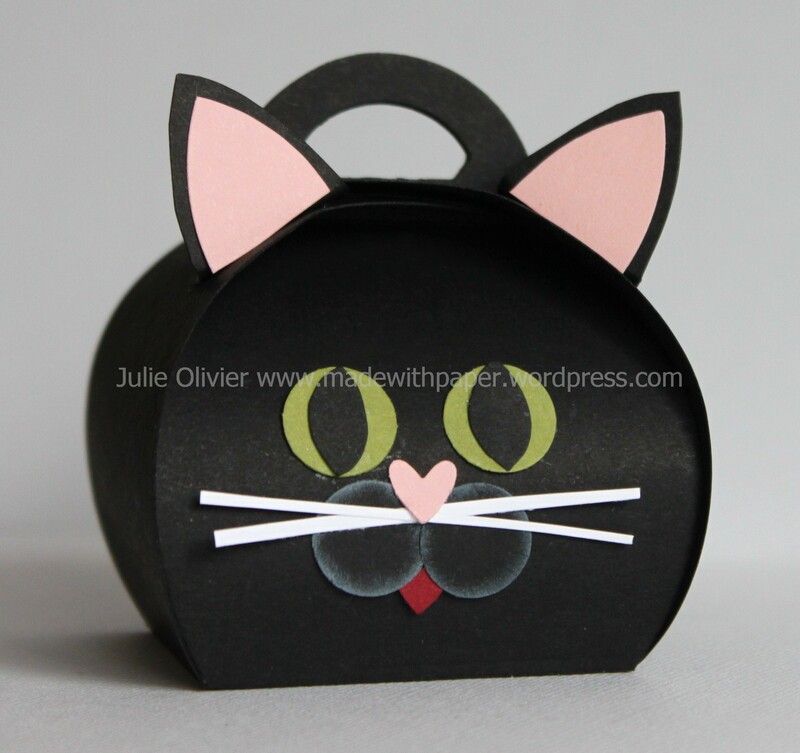 Today’s post will be quick, I would like to show you the “Cat Curvy Box” in more details… Perfect for Halloween or any “cat lover”!!! 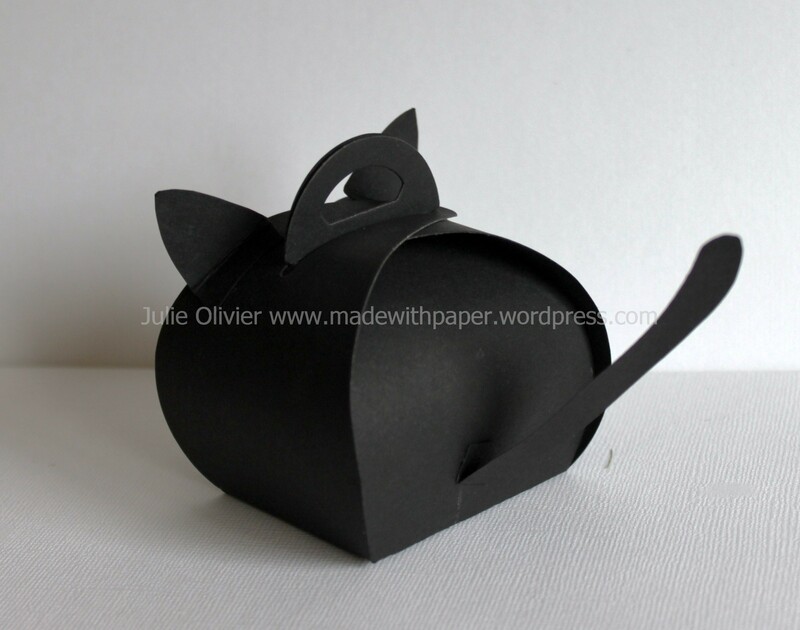 To make this cute cat box, I used Basic Black card stock and the Curvy Keepsake Box Thinlits dies as the base. The eyes and “cheeks” were made with the 1/2″ circle punch. I sponged some White ink on the cheeks to make them stand out more. The nose and mouth were cut with the little heart on the Owl Builder punch. For the mustache, I simply cut 2 tiny strips of Whisper White card stock and adhere them in the center. The ears were cut with the Blossom Petal Builder punch. I folded the bottom and glued them in place with multipurpose liquid glue. I used a piece of the left over Basic Black card stock (after I cut the box) to cut a tail for my cat! 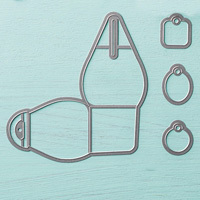 Tools: 1/2″ Circle punch, Owl builder punch, Curvy Keepsake Box Thinlits dies, Big Shot. 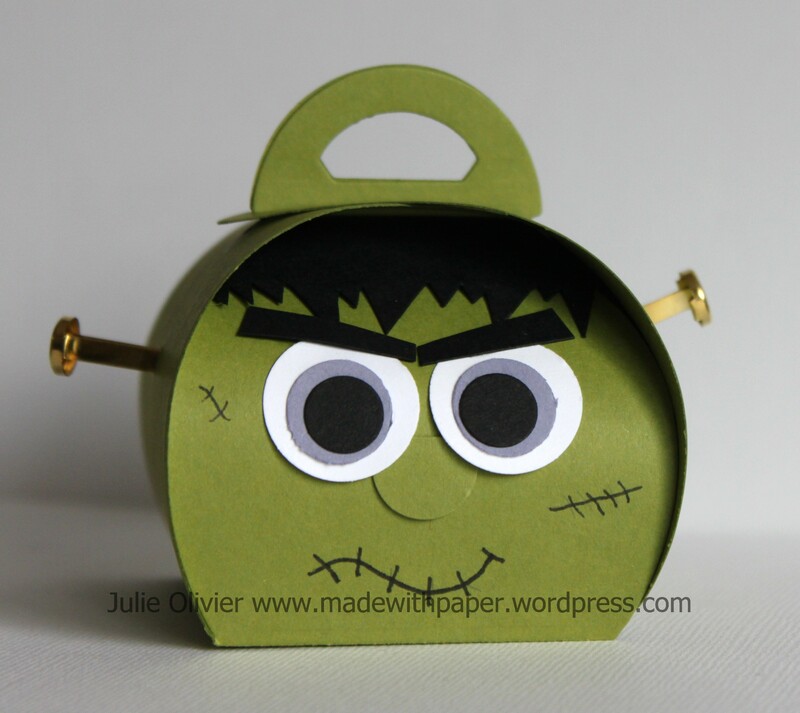 Today’s Halloween Treat box is “Frankenstein” !!! 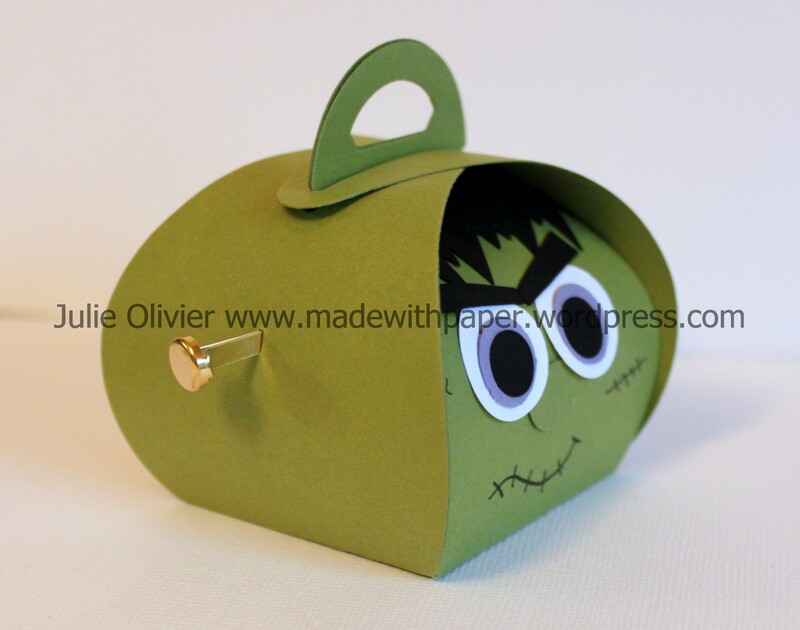 I used Old Olive card stock to make the box, using the Curvy Keepsake Box Thinlits Dies and Big Shot. The eyes were made with the 3/4″, 1/2″ and 3/8″ Circle punches. I used the Basic Black marker to draw the mouth and scars. 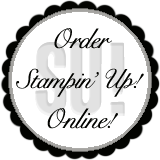 Tools: Big Shot, Curvy Keepsake Box Thinlits Dies, 3/4″ Circle punch, 1/2″ Circle punch, 3/8″ Circle punch. Piercing tool and piercing mat. I’ll present each design in details this week, so visit my blog everyday!!! One surprise design will be revealed at the end of the week! 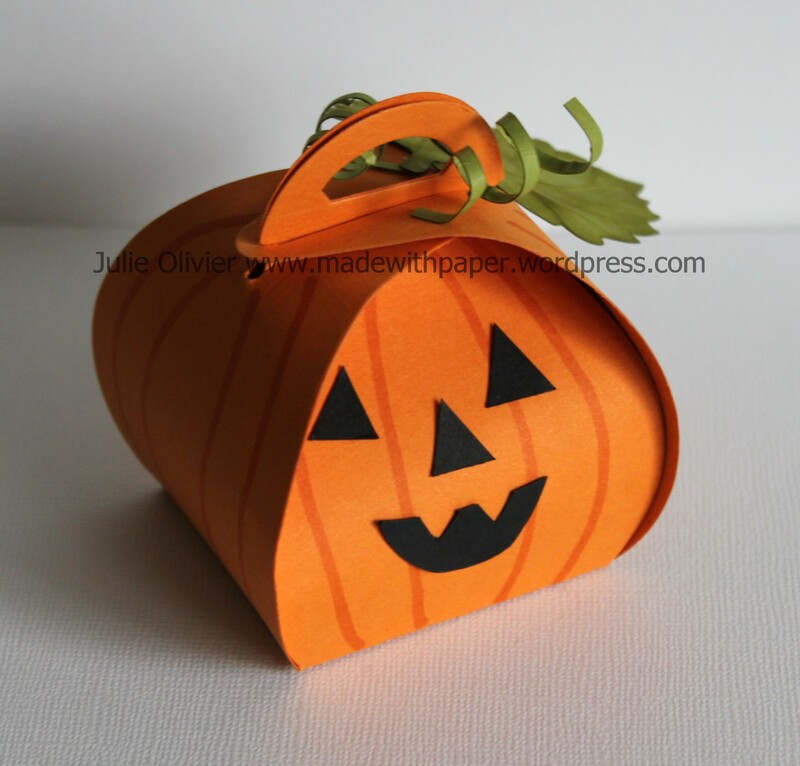 Today’s featured Treat Box is the Pumpkin! To make the box, you need to cut 2 times the box template using the Big Shot and the Curvy Box Thinlits. You simply adhere the 2 parts together in the center. Come back tomorrow for one more design! Happy Halloween! 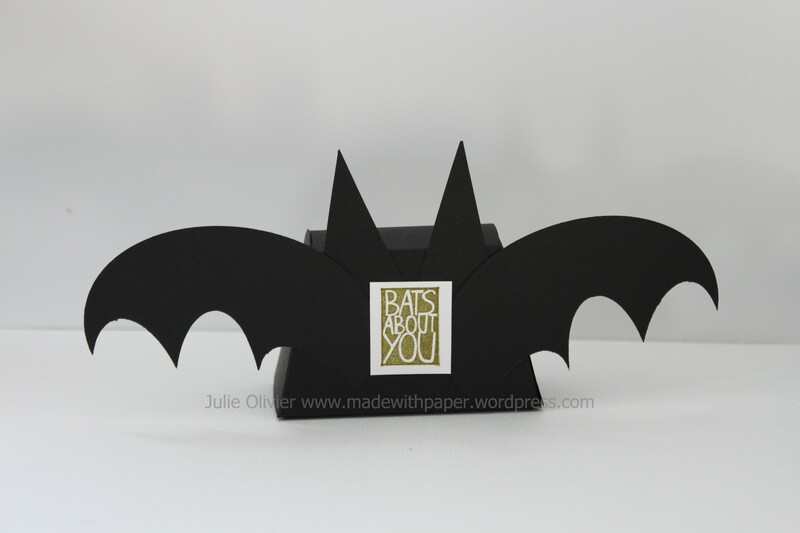 Bats about you! Happy Halloween! 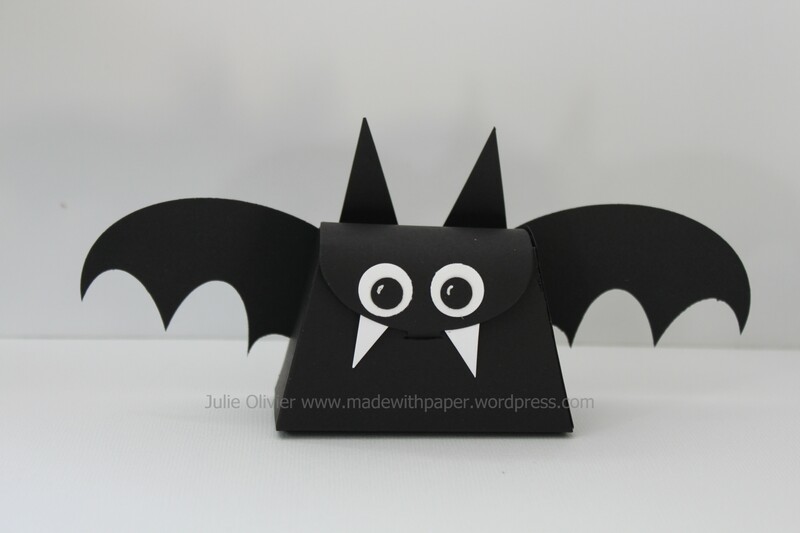 Here’s my project for you today: a little bat purse! We made this little purse at my last Stamping club night and everyone thought it was so cute! I used the Little Purse Bigz L die to cut the purse itself in Basic Black cardstock. The teeth and the ears were hand cut. For the wings, I used the Oval framelits and then used the Oval punch to cut the bottom. 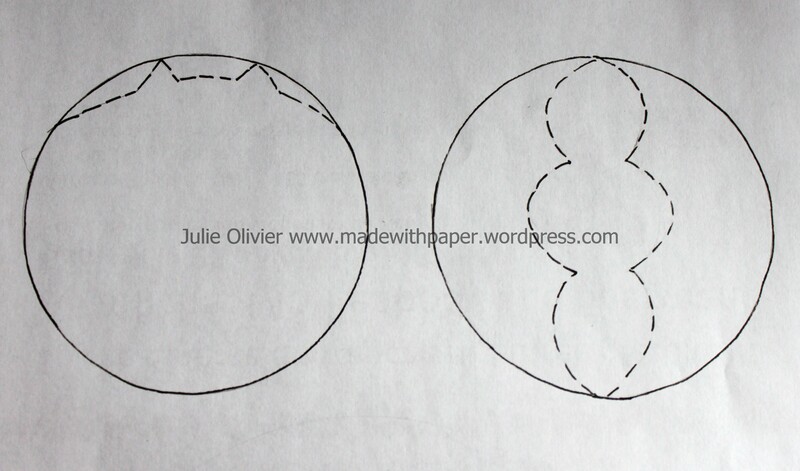 For the eyes, I used the 1/2″ Circle punch and the Itty Bitty Circle Punch. This stamp is from the Halloween Hello stamp set and it goes so well with this that I had to use it! 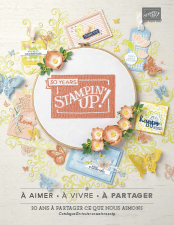 We stamped it in Old Olive ink and cut it with the 1″ Square punch. Halloween is almost here! Have your children decided what their costume will be? Mine want to be an Indian, a Forest Fairy and a Magician. I did some sewing (and I still have more to do!) but I’m almost done!!! I have to admit that I wasn’t sold on the Forest Fairy at first, but it came out pretty nice! 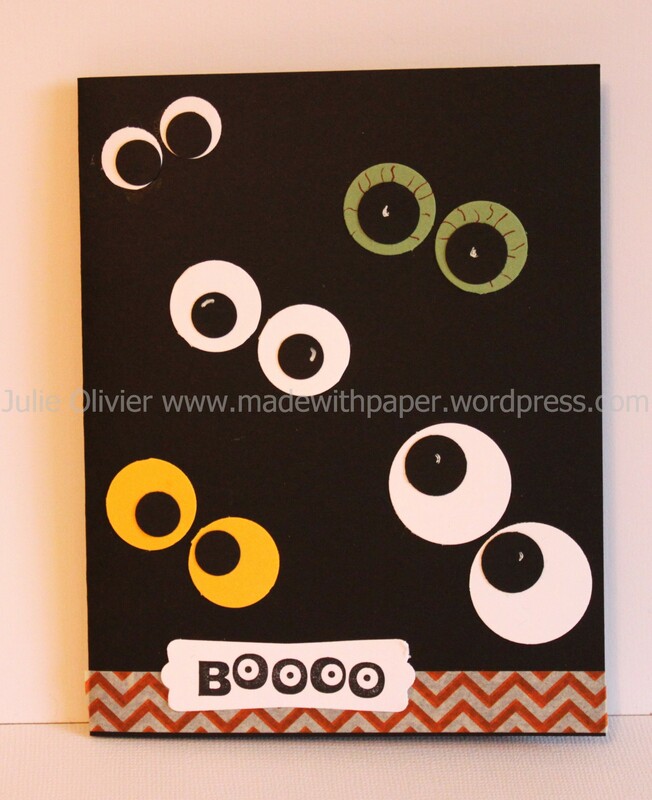 This is a quick craft to do with children for Halloween and I’m pretty sure they will love it! If you have some circle punches, that will greatly help you! 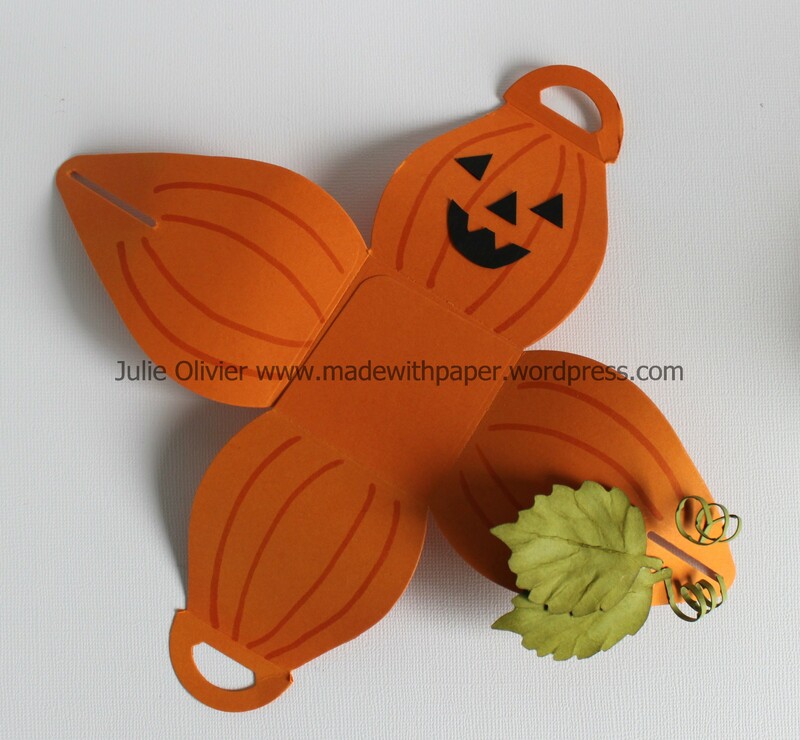 I used the 1/2″, 3/4″, 1″ circle punches and the circle from Itty bitty shape punches. 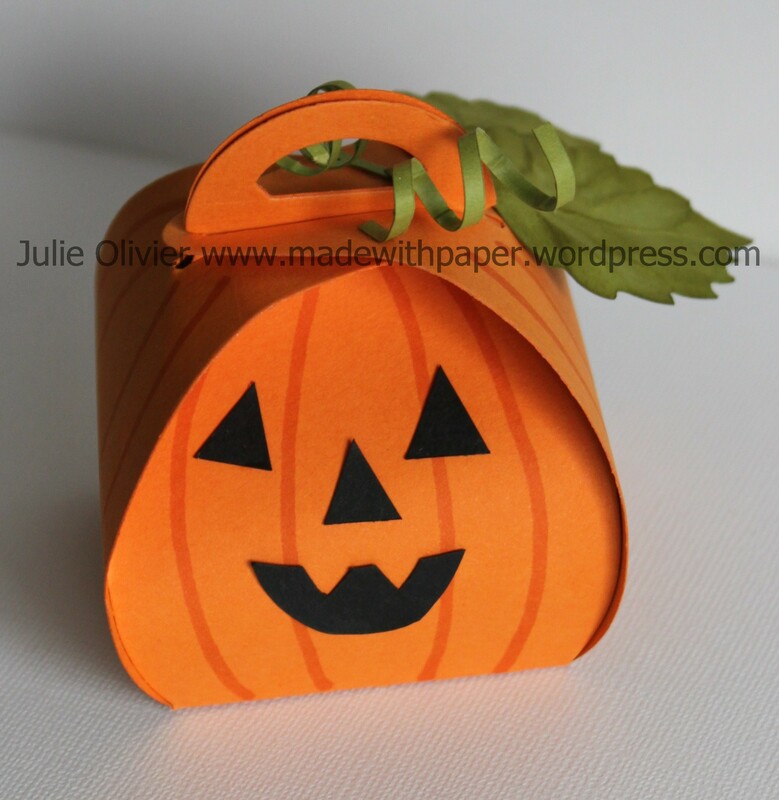 I also used some Halloween Washi tape (Witches’ Brew Designer washi tape). 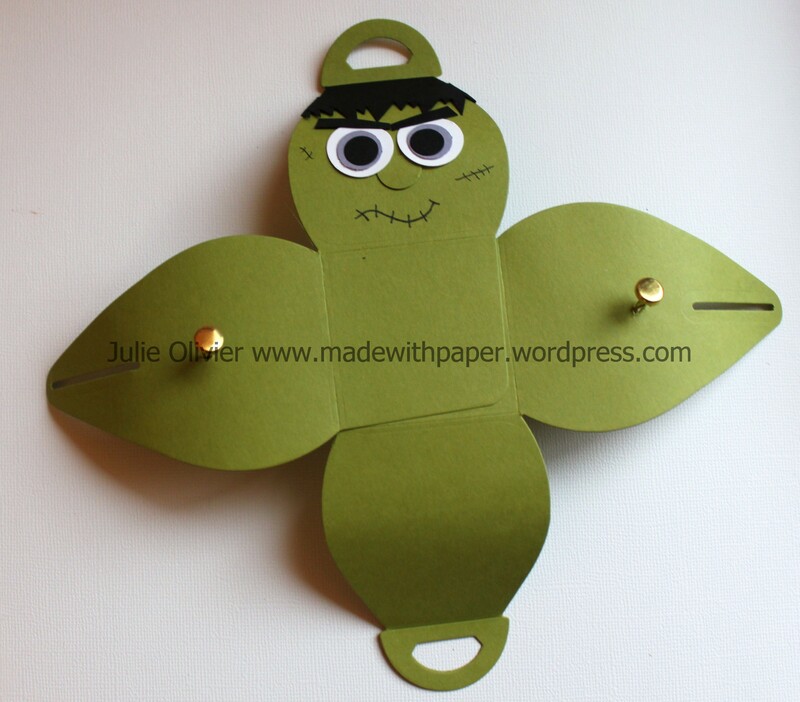 Use any color of cardstock you have on hand to punch circles and go wild!!! You can also make this other one quite easily. 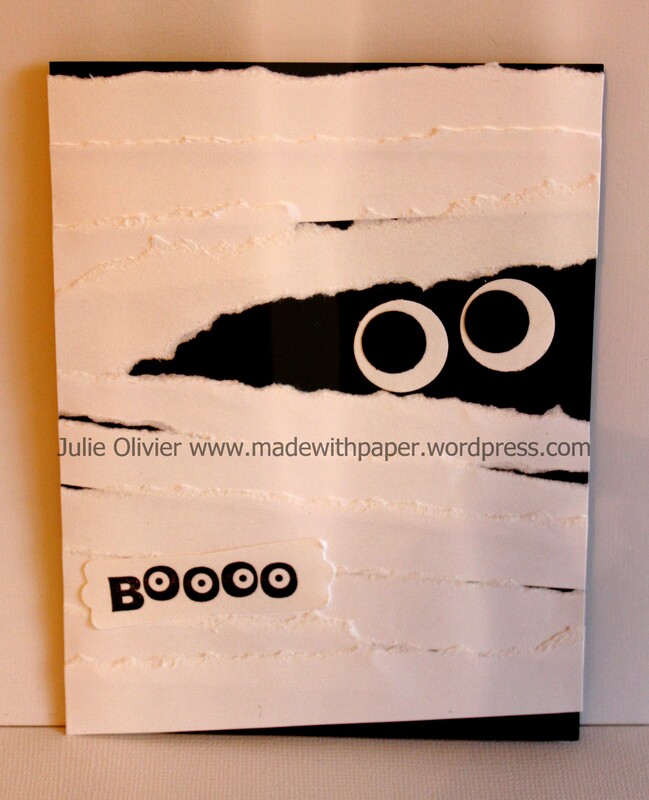 Simply tear some strip of white cardstock and glue on your card! Add 2 eyes and voilà!